There are two things you can expect when you smoke weed, you’re going to get high...and it’s going to smell. Weed has a very distinct scent. While smokers love it, this lovely mistress can blow up your spot by stinking up your house, your clothes, and your car. So how do you smoke weed without smell? From cheap to pricey, let’s scope out the many ways. To toke up, you need smoke. Smoke needs to escape somewhere. If you’re outside, it’s the air, your clothes, and your hair. Inside smokers, it’s the walls, curtains, and ceiling. Then there’s the cannabis itself. Just storing cannabis in a closet can smell up the whole upstairs. So, the key to getting rid of the smell of cannabis is to eliminate the odor, not mask it. You want to deodorize these scents, not add more scents on top of it. Although a little perfume or cologne won’t hurt, don’t go nuts with it. Don’t run around your house with a Hawaiian-scented aerosol can. Instead, find ways to neutralize the odor itself. All living plants that are picked begin to decompose immediately. That’s part of the smell that lingers from leftovers in the fridge to cannabis in a closet. One of the cheapest and sometimes most effective ways to neutralize the odors of old smoke, a cannabis stash, or old leftovers, is baking soda. Baking soda is made of sodium bicarbonate. Sodium bicarbonate is an amphoteric chemical. Therefore, it can have a chemical reaction with any molecule whether sodium bicarbonate is interacting with a compound that has a strong base or acid pH. When we smell lingering smoke or a stash of weed a room over, it’s the fatty acids within the terpenes that are causing this scent. Particles in sodium bicarbonate enter the atmosphere from the baking soda box and fight the odorous acid vapors to neutralize the air. The best way to air out a scent…is to air it out. Introduce fresh air into the mix by cutting up the stagnant weed smoke. Turn on a ceiling fan to chop up the musk. From there, open a window to interject some natural scents. Just a few hours and a once hot-boxed room could be fresher than clean linen on the clothesline. The most effective way how to smoke weed without smelling like it inside is with an air purifier. Depending on your needs, air purifiers run rather cheap and are available at all discount retail outlets. Whether you are smoking indoors or have cannabis flower tucked away under a bed, an air purifier takes the stale and odorous air into the machine. When the air gets sucked in, it is run through a filter. Many are HEPA, while others are activated charcoal. HEPA is an acronym for high-efficiency particular air. When you force your air through the HEPA filter’s fine mesh as you exhale, the mesh soaks up odors particles living in your weed smoke. HEPA or activated charcoal, the odorous particles are neutralized and then pumped back into the air. Air purifiers are great because you can customize how often they need to run. They can be continuous to hide the scent of your stash or come in to clean up your dirty work after a random indoor smoke session. Candles are a great way to purify the air. For the most natural route, you should opt for a white wax candle that is free of fragrance. Adding synthetic particles into the air only masks the odors. With a plain candle, the flame releases negative ions into the atmosphere. These negative ions battle positive charges in the atmosphere such as pollen, dust, and weed scents. After the positive ions are neutralized, they are sucked into the candle or fizzle to the ground. If you do want the pleasant smells of synthetic candles, they will do the trick. It just won’t be a more effective route in purifying the air. However, I can’t blame you wanting to make a trip to Yankee Candle. Want to liven up the room without the use of synthetic ingredients? Essential oils are a great way to combat the smell of weed because it’s like fighting fire with fire. What gives both essential oils and cannabis their therapeutic properties are also what gives them their scent...terpenes. So, you need to find the right terpenes that will combat those of weed. Diffuse essential oils such as clary sage, lavender, lemon, peppermint, and rosemary to clear odors in your room. Also, these oils come with a litany of health benefits that may complement those who use medical marijuana. Nothing will change the whole atmosphere within your household than cooking. Make some spicy Thai on the stovetop, throw some cookies in the oven, or microwave some buttery popcorn. Guaranteed that no matter what you make, whoever walks in your house will be more interested in what’s cooking rather than the fact that you’re baked. This is like a handheld air purifier. The Smoke Buddy has a bunch of activated carbon filters inside. These carbon filters are extremely porous and capture all the smoke that comes through. As you blow out, the filtered smoke comes out of the other hand without the scent of weed. While this is handy, the Smoke Buddy is not the most discreet. It may be used outside, but it is best suited to smoke weed without smell indoors. If you are concerned that your house is going to smell from smoking, the easy answer is to go outside. Just be sure not to be near any open windows. Smoke travels far and wide and will easily get sucked into any changing environment. So, if it’s traveling past an open window, a good portion of the scent will waft into the opened area. If it’s colder outside, you have a better chance of masking the smoke. As you breathe out in colder weather, you will see your breath in front of you. Your hot air (odorous cannabis smoke included) solidifies in colder weather. Therefore, the scent won’t be as potent as it hits the open air. Not to mention, it will be denser so it won’t travel as far. This is much like a Smoke Buddy but a lot cheaper and discreet to use in public. If you want to smoke outside without drawing attention, you will need something that will soak up as much of the scent as possible. Make a DIY sploof to blow smoke into. All you need is a paper towel or toilet paper tube. Cover one end with either a dryer sheet. You can use a piece of toilet paper rubbed in soap instead, but for this instructional, I am using a dryer sheet. Bunch up the dryer sheet and put it inside one end of the tube. Wrap another dryer sheet around the same side on the outside. Hold the dryer sheet in place by securing it with a rubber band. When you smoke, push the open end of the tube to your mouth. Make the fit airtight and exhale. Push hard as you can, and the dryer sheets will filter the smoke to remove the scent. While you can use a paper towel tube, a toilet paper one works better due to its smaller size. There seems to be less smoke sitting around in the chamber, making sure all the smoke goes through the filter, instead of leaking out the mouthpiece. Keep in mind, using a DIY sploof may filter the smoke you blow out, but the remaining smoke rising from the end of your joint or the flower in your bowl will still rise into the atmosphere. When push comes to shove, have another smoker die on the sword. 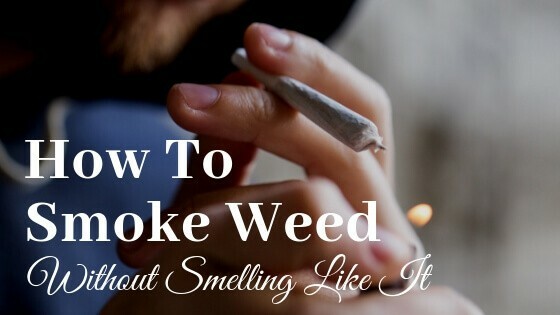 One of the best ways how to smoke weed outside without smelling like it is to mask the smell with cigarette smoke. Find a bunch of smokers and hide among them. That way no one will be able to pinpoint who the culprit is without a few obstacles. No matter if you smoke indoors or outdoors, you are going to smell like weed. To smoke weed without smell, you must tend to your hygiene. Think about what the smoke touches. Wash your hands, face, and maybe even your hair if you have the chance. Brush your teeth or pop some breath mints. If you have the opportunity to change clothes, do that as well. Fabric soaks up many scents it comes into contact with.